Nobody in the world knows Soviet and Russian music bands. Especially in the West. 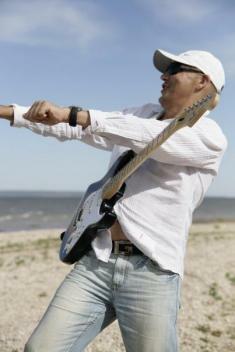 However, musicians from Russia at different times fell in the Western charts. All attempts to promote and impose our popular music on the Western public failed. Russian music is very secondary and backward - both technologically and stylistically. Who from our musicians really achieved high places in the Western (and it, in musical sense, first of all the USA and great Britain) charts and in General is more or less known in the West? These are Groups such as "Pesnyary"-1976, Boris Grebenshchikov-1989, Gorky Park-1990,Tattoo-2003 and the group "The show broadway group" - 2019. "The show broadway group" in 2018 receives 12 international awards from the Academy Awards and was nominated for artist of the year, two songs "Birthday" and "Music of rain" get into the American collections "Jazz the Beat and Sway" and "Dance Move Touch Down", which are released by the company Shami Media Group, Inc. In August, 2018 the group is in SHOW BUSINESS at the ACADEMY a GRAMMY. In 2019, the group received a certificate for the annual rotation of "RADIO # SMILE" in Spain, receives an international registered name in SHOW business, and the Academy of GRAMMY has provided an opportunity this year to apply for the 62nd annual Grammy award. And here's the Premiere! In the first 19 April 2019 about a group "The show broadway group" ON the AMERICAN INTERNATIONAL RADIO "Music Mafia" (Atlanta,USA) will tell the Biography about the band, and two songs "Birthday" and "During flaing"will be performed live.